The Contacts database is a shared resource of over 40,000 contacts and growing. As a JHP author you have full access to this. Over the years we've been building up the list in different subject areas. The publicists use it extensively, feel free to do so yourself, and to add to them (we add several hundred a month). It still scratches the surface, but is a quick way of getting started, and increases in value the more comprehensive it becomes. 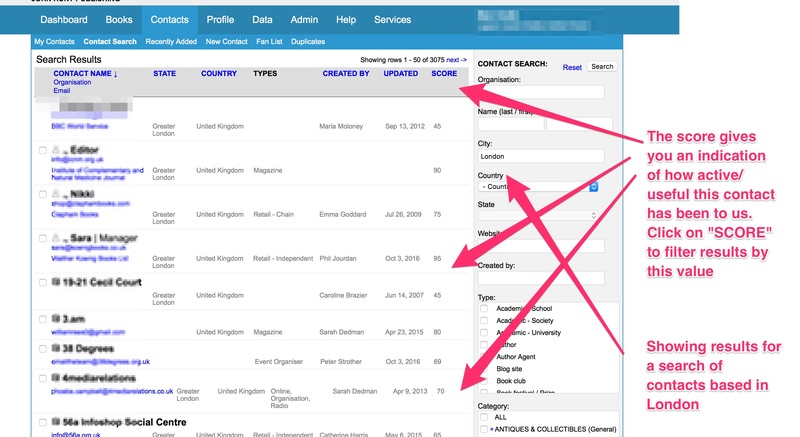 The database shows who created the contact, when it was last updated, the contact details, the marketing history with that contact, and how significant they've been (they're rated by "Score"). So if you go to CONTACTS for instance in the top blue line of your screen, and in "Categories" choose RELIGION, and then click on the subsection PAGANISM, you'll find 1285 contacts, including (as of 2017) 185 bloggers, 111 reviewers, 86 academic contacts, 60 event organisers, 165 journalists/magazines/newspapers, and 405 retail outlets that carry pagan books. It helps a lot to co-operate in building these lists so that we don't have to reinvent the wheel with each title . We send monthly emails about new publications to subscribed contacts. You can link the contacts to your book by adding activities (see below). Other authors can contact them about their books, just as you are contacting people added by other authors. A useful site for looking up US contact information is www.manta.com; enter the company name in the search box and contact info is supplied if available. It is not necessary/useful to add commas. It is really useful to have the website address. Copy and paste the address with the http://. An organisation is a named company that an individual works within. This includes named blogs. An individual is someone not affiliated with a named organisation. An example would be a freelance journalist. An email address is really important to us, it is how we contact most people. Please search for and add this correctly. Do not add a note in the email field to say there is no email. Please add what you can in the “Notes” box, that could be useful for others searching for relevant information, like how to handle a launch at this bookstore. Bloggers have become an important resource for book publicity, and many have a Review Policy. It helps to add this to notes, as it is really useful information to have at a glance. Type and Categories are very important, it means we can pick up the contact on a search and add it to our PR lists. Duplication can be a large problem for any database, so to help us keep our data clean please check to see if your contact or the organization already exists in our system. Go to Contacts and search for the contact in Name (last/first). If your contact appears you can hover close to it, “View” it and update any relevant information by clicking on “Edit This Contact” on the right-hand side. Click for a list of contacts associated with this organization. Please double-check that your contact isn’t listed with a different spelling, if so you can then view it and update it if necessary. As a final check, once you have entered a contact/organisation and saved. If you see a yellow triangle with a ! mark and DUPLICATES on the right hand side, then you have possibly entered a duplicate and you can click the symbol to double check. This DUPLICATE symbol will sometimes report a duplicate due to the email being the same for the organization and the contact. This is often unavoidable, and is not a true duplicate and can be ignored. When in an organization, check Contacts (right-hand menu). If the individual is not there then you can choose to “Add a contact to this organization” at the bottom of the right-hand menu. If your contact has a separate address (home address perhaps for a review-copy request) then you can untick the “Location” box, which will then allow you to put in a new, separate address. Fill in the “Online” information, “Phone” if necessary, “Description” and “Notes” if relevant. Please make sure you include full notes on any approach or submission guidelines a contact may have. “Contact Type” is important to how our database works, as are “Contact Categories.” In the category section you will see a + symbol next to each; where this appears you can click on it to see subcategories, and within those subcategories there can be more + signs for further options. It helps us if you can make the category as relevant as possible. If you wish to indicate the category as a whole, please click into the + sign and select the ‘General’ subcategory. For example, a general bookstore or an MBS magazine that deals with all MBS topics. More below. When you have finished, click “Save Contact” at the bottom right. An email address is really important to us, it is how we contact most people. Please search for and add this correctly. This should be an organizational email, not an individual. An individual one belongs on the individual contact page. Keep the email field to the email address only. Any online links need to have the http:// part of the URL, this enables the system to link automatically to the outside site. Some contacts such as independent reviewers or freelance journalists have no organization. These can be added in a slightly different way to the organization. Click “New Contact” which you will find in the lower of the blue bars at the top of the horizontal screen, and you have the option of “Add an Organization” or “Add a person”. Untick (by clicking) the Location button. Fill out the Location details for the individual that now opens. Continue with the form for Online links which need to include the http:// part of the URL. Please pay particular attention to Type and Category. Magazine, Retail, Blog site, etc. There are instances where an Organisation, for example an Association, also has a magazine or newspaper associated with it. In which case the Type would be Organisation and Magazine/Newpaper. Another person using the contact database, might look for magazines on Aging. The American Society of Aging has a magazine/newspaper associated with it – Aging Today. So it does need both Types ticked in order for it to come up on a search. However don't overload the Types. Stick with the main purpose for the existence of the contact. If your contact is, for instance, a general bookstore, then for a fantasy novel the most suitable category would probably be FICTION/FANTASY. But if your contact is, for instance, a blogger, they might be specializing further, so FICTION/FANTASY/HISTORICAL might be more appropriate. Here the contact should show only a sub-sub category, and not FICTION/GENERAL category (we match a book to contacts that fit the right categories and this information "at a glance" means that the next person to use the contact, does not have to research it). If so please select the + next to the main category, which will then expand to give you further targeted options. Within some of those specific genres there could be further subsections indicated by a + sign next to the subcategory. Select your genre. Similarly with non-fiction this also works the same way. For example, if your book was about Interfaith Religion, and you had contacts specific to this subject, then you would select the subcategory of COMPARATIVE RELIGIONS within RELIGION. We have just learnt that you may be interested in our books. In our newsletter booksellers, editors, producers, fans and reviewers discover our books and find details of offers, book launches, podcasts and articles. We invite you to subscribe. To subscribe, click here or go to www.johnhuntpublishing.com/john-hunt-company.html. If you do not wish to subscribe, it is not necessary to take any further action. You will not receive any further emails from us. You can search geographically, for local contacts, or by "type," or by "category." Categories are defined by the book industry standard BISAC codes. There are main categories, such as BODY, MIND & SPIRIT or PSYCHOLOGY and then to see sub-categories click on the + symbol. Any sub-category with a + has further options. When you have your search selection, there is a menu bar in blue. You can filter the search further by any one of those options. Click on the heading you want, and after a moment an arrow will appear next to it. Click on that to filter. "State" or "Country" for working with local contacts. You can filter by "Score": the score gives you an indication of how active/useful this contact has been to us. A contact with a score of 80–100 is probably one that is in regular contact with us, depending on the organization and what they do. You can also view the "Marketing History" on the individual contact page. More below. You may encounter a contact where lots of people have tried to get interest, but there has been nothing more than a list of Email/Press Releases being sent. It could be that we are doing somethig wrong. The email may have changed, or the person could have left. Or we have the wrong categories applied, and this needs to be changed. Please do take the time to update that contact. You can also save selected searches. So if for instance you wish to find out how many bookstores there are in your county/state/city etc., you can do a search in the right-hand search area. At the bottom of the search results list: “Choose an action” to create a new list or you can select to add contacts to an existing list. Name the list in: “Save this Search.” Your list will now appear in “My Contacts.” These searches will remain in your “My Contacts” list until you decide to “Delete” them. You can add to these lists at any time; if you added another bookstore, for example, once you have "Saved" the contact and "Closed edit form" there is an option on the right-hand menu to "Add contact to saved list" with a drop-down option where you should see your previously saved list of bookstores. You can also continue to search on a category to add to a saved list; just choose contacts that have been added to the system since you last saved your list. Please note that once you have used the search facility on the right-hand side, you need to hit the “Reset” button to clear the search criteria. There is a swathe of contacts that aren’t visible to you, if you’re wondering why they’re not there. Broadly speaking, these are trade contacts who want to work through the publisher and complain to us if authors contact them direct, including trade magazine editors, head-office bookstore buyers, wholesalers and sales reps.
You can change details on the contacts you have entered, or any other contacts. Please do so whenever you come across one that needs updating or amending. Click on “Edit this Contact” in the right-hand panel. If you have searched and found a named contact for an organization, but you know that contact has left and been replaced with your new contact, do remove the old one and replace with the new. We want to keep all the activity history as that prioritizes the contacts importance, and keeps a record of what has happened. So please overwrite the old contact with the new. This is particularly relevant to radio shows, bookshops and event organizers, where there is a high turnover of staff. You can delete contacts that you have entered, but not those entered by other people. If you do come across a contact that is no longer in existence, but you cannot delete, please put a note in in the Description section to say so. An admin user can then delete as they come across them. You can avoid having to search repeatedly for the same contact criteria by saving them. You can also download details of these contacts in a format that can then be imported into Excel, if you want to use the details in a mail or email merge, for example. From "My Contacts List" select the list you wish to use, and click "Run" on the right of the lists. Scroll to the bottom of the page to the dialogue box: "With these results" and choose "Download list to Excel." This will download a file that can be saved and opened in Excel. You can then copy the email addresses into BCC in an Outlook email. You can then update the database activities all in one go, when you "Add an Activity" in the "ACTIVITY LIST" fill in the details, then choose "Use a saved list." Save. See "Permissions" when entering a new organization/contact. Untick: “Accessible by authors” if you wish to block access. Tick “Subscribe” if your contact has agreed to receive mailings from us. We hope they will. When a contact is added to the database it is given a score which reflects how useful this contact has been and will be. The inclusion of the email address, website and category as well as how active and recent its Marketing History is all contribute to its score. High is good. This score is displayed on the contact's page and the criteria are in "Help," e.g. SCORE: 60; CODES: C,D,E,J,K,L. To search by score, click on "Type" and "Category" on the right hand side to select the list you want. When it comes up, there is a list at the top of "Contact Name", "State", "Country", "Type", "Created by", "Updated", and "Score". Click on "Score", and a downward arrow will appear. Click on the arrow to reverse it and list the contacts in likely order of usefulness.